Henry was a one year old spirited and mischevous collie-mix when Brian first met him. The moment Brian walked in the door, Henry knew instinctively who was in charge--it was amazing! I find that when Henry is running wild, which he tends to do with my son, all I have to do is the "mother dog calming correction," as I call it. Within a few seconds he settles down and becomes a CALM DOGGY. Brian truly has a gift with dogs and the patience to train the owners which seem to pose the greater challenge (or maybe that is just in my case). With practice, and yes, you'll have to practice with your dog, you'll find that the behavior your dog exhibits with Brian begins to rub off on his behavior with you! I consider my dog (and myself) very lucky to have happened to hear the radio spot for Calm Doggy. I have a dog that WAS on the edge from insecurities and is now truly a "calmer" doggy than he was before meeting Brian. We've got a bit of a ways to go, but with Brian's expert help and tips for working with dogs, we are well on our way to have a balanced and happier dog. I would recommend him without the slightest hesitation for any issues. I tried other training classes and services, but none have come close to moving my dog forward as the time he spent with Brian. We adopted our 9 month old dog from a shelter. He is cute and smart but we soon learned why he was at the shelter.... he escaped from the yard. No matter what we did, he could find a way out.After a trip to the emergency vet clinic because he tore up his feet trying to get out of the yard I found Brian. We have had other dogs and been through other types of dog training programs so I wasn't sure our dog could be trained in two sessions but we were out of ideas so we booked a session with Calm Doggy. Brian has a calm confidence that exudes the training environment. He started out by making sure we understood basic pack psychology and how it applied to our dog. He patiently helped us understand why our dog does the things he does and he taught us how to interact with the dog in ways that generate the behavior we want. When we first got our dog I didn't see him sleep for the first three weeks. He was always in motion. Brian recognized it as pent up energy. Although the dog was getting walked every day, we were not mentally challenging him enough. A few days after our first training session the dog calmly rested at our feet while we watched TV. I was amazed and pleased but more importantly it was proof that Brian's methods work! Brian taught us how to be confident - even though this training was new to us and we didn't really know what we were doing. He gave us practical tips that made it easy to remember what to do, for example when learning to work with our dog on the Halti he taught us, "when in doubt, just keep walking". I can not say enough about the difference in our dog since working with Brian of Calm Doggy. The day we found Brian was a lucky day for us and for our dog. Brian has assisted us tremendously in training our dog Katie, to be more accepting of other dogs, as well as people. When we adopted Katie , she was only 5 months and had already been abused. She was terrified of everything and everyone. Katie used to hide from dogs and people. After we learned various techniques from Brian, Katie has improved very nicely. When we take her for a walk or to Brian's doggie socialization classes, Katie is now much more willing to interact (sniff and play) with the other dogs. When we take Katie for a walk, she will play with other dogs. Katie also, is more willing to be around people. She used to run and hide and now she will stay in the room when people are visiting. We knew something was going to have to change with Charlie's behavior. Before Brian worked with us and Charlie, I was in constant fear that Charlie was going to bite any new person he came in contact with. But when Brian first came to our house for a consultation, he assured us that he could work with Charlie's behavioral issues. Brian was able to break down Charlie's bad habits and replace his anxiety and fear with productive activities which helped to make him a more confident, calm and happy dog. We appreciated how Brian taught us the difference between excitement and happiness, when to correct behaviors and when to give affection and how to become calm pack leaders. Working with Brian has been an enlightening experience and we are thrilled to finally have a happy and calm dog in Charlie. Signup for email alerts and learn when the next class is by clicking here. Call Today! (913) 735-3364. Overland Park, KS Dog Trainer | © 2019 Calm Doggy, LLC. 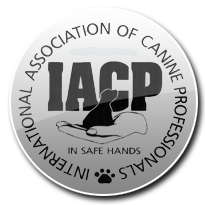 Member of the IACP. Kansas City Dog Training Services.